But if you’re lucky enough to find yourself deep in the heart of Texas, you also know what a special place the Lone Star State can be. It’s no wonder folks took to singing about it! RV campers especially know how unique and beautiful this landscape is, which covers everything from prairies and grasslands to wave-crashed coastlines to deserts. And there are plenty of incredible Texas RV parks and campgrounds to choose from, whether you’re looking for a simple boondocking setup or an all-inclusive resort experience. And whether you’re traveling in a Texas RV rental or in your own rig, you already know RV shows are a great way to learn more about camping and possibly discover the next RV you’ll keep in your driveway. So, without further ado, here are the six best RV shows for you to attend this year in Texas. Billing itself as the largest RV show in south Texas, this San Antonio expo brings together four reputable south Texas dealers representing dozens of the latest and greatest rigs of all shapes and sizes. This year, more than 5,000 eager campers are expected to attend in order to explore, walk through, and score great deals on the 300+ rigs that will be made available. Thursday, January 4: 10 a.m. – 6 p.m.
Sunday, January 7: 10 a.m. – 6 p.m.
Children 13 and under: FREE! Discounts: All attendees will receive special $8.00 entry on Thursday, and senior citizens 65 and older receive $8.00 entry on Friday. Saturday and Sunday, RV Club Members with proper Club ID receive $8.00 entry. See details above for military and first responder pricing. Non-combinable with any of these offers: Click here to receive a free, special $2.00 off discount coupon! As one of the longest-running and largest RV and travel trailer shows in Texas, and with a sponsorship coming directly from the Texas Recreational Vehicle Association, the Tarrant County RV Show is the perfect place to discover why RVing is such a great way to see the state of Texas. What’s more, you may just find yourself falling in love with your very own vehicle while you’re at it! And with ten participating dealers and thousands expected to attend, you can bet you’ll find some of the best deals in the state at this camper and RV show. After all, those dealers will be vying for your business, and with all those rigs and all those people, that’s some pretty stiff competition! Do keep in mind that, due to the Texas Blue Laws, motorized vehicles may not be purchased on Sunday. So while they’ll be open for your inspection, motorcoaches and campers won’t be available to buy on January 7. You will, however, still be able to purchase non-motorized vehicles such as travel trailers, fifth wheel trailers, and toy haulers. Thursday, January 4: 11 a.m. – 7 p.m.
Friday, January 5: 11 a.m. – 7 p.m.
Tickets: Can be purchased online at this link or on the day of the show at the door. Note: Tickets purchased online are valid for one day’s admission only but may be used on any day of the show. A return visit on an additional day will require a another ticket purchase. Discounts: Click here for a free $1.00 discount coupon. See details above for senior pricing. On Sunday, January 7, Family Day, the first 300 kids 12 and under with paid admission will receive a Dallas Cowboys knit cap! Did you know that the Texas Recreational Vehicle Association was the first independent RV State Association in the country? It was — and they’re the sponsors behind this well-loved annual expo held in the town of Mercedes, Texas. This year’s All Valley RV and Outdoor Show will take place over the second weekend in January, which is the perfect time to find your next RV. After all, you have a whole year of adventures awaiting you! 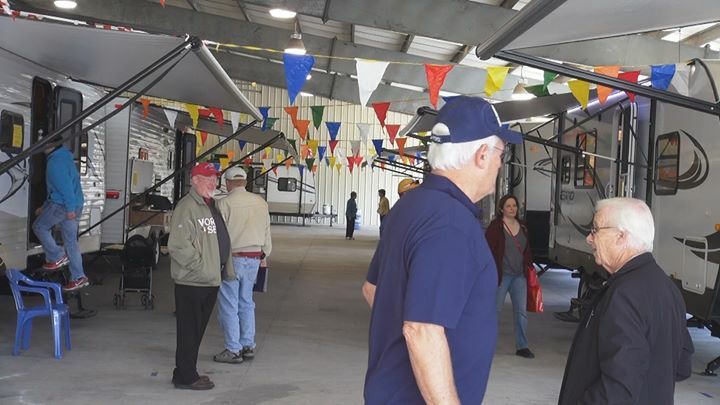 Along with dozens of RVs and travel trailers, the expo also includes hunting, fishing, and other camping vendors and exhibitors. It’s about all things outdoors… just like you! Chilly Texas air have you dreaming of sandy beaches and palm trees? Then you have even more reason to attend. You’ll be entered to win a week-long vacation to Cabo San Lucas, Mexico, just for paying the price of entry. Thursday, January 11: 9 a.m. – 5 p.m.
Friday, January 12: 9 a.m. – 5 p.m.
Saturday, January 13: 9 a.m. – 5 p.m. 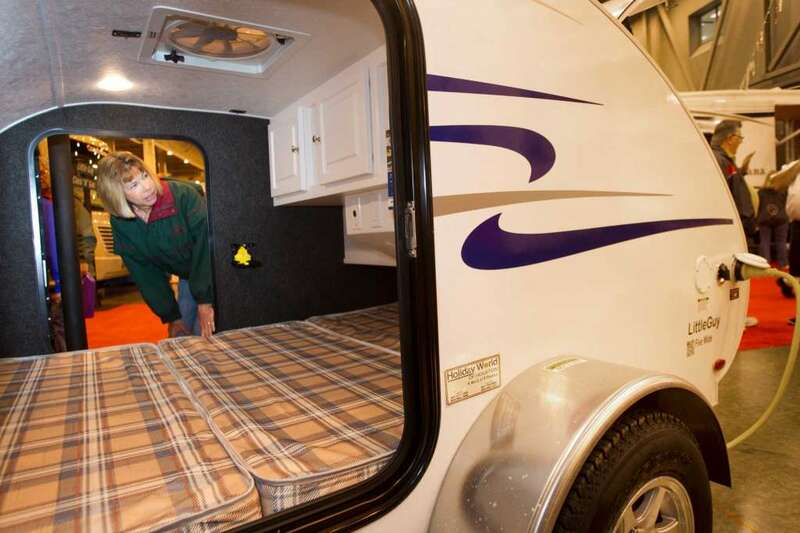 This RV expo’s been taking place since 1965, making it a well-loved Texas institution. Plus, it takes place right before Valentine’s Day this year — so if you’ve been looking for the perfect vehicle for your next romantic getaway, this is the perfect opportunity! Tickets can be purchased ahead of time online or day-of at the box office, but keep in mind that each ticket only gets you a single day’s entry. With over 600 rigs to see, exploring this show in one day will take diligence! Wednesday, February 7: 12 p.m. noon – 8 p.m.
Thursday, February 8: 12 p.m. noon – 8 p.m.
Sunday, February 11: 12 p.m. noon – 6 p.m.
Tickets: May be purchased on-site at the RV Show Entrance Box Office or online via Ticketmaster (fees apply; check back as showtime nears for active link). PLEASE NOTE: Four hours prior to show opening, tickets are not available from the Ticketmaster link on that specific day. However, tickets may be purchased for future show dates. With hundreds of RVs offered by six of the best-known and most reputable Austin area RV dealers, the Austin RV Expo is a great RV camper show to come to if you live in this special city that so seamlessly combines the urban and outdoor lifestyles. 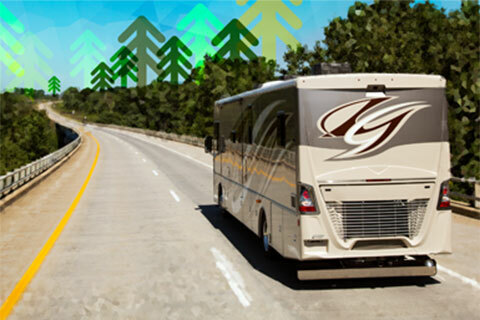 Conveniently located at the central and spacious Austin Convention Center, this show features 150,000 square feet of RVs and RV accessories — so it’s no wonder it garners about 10,000 attendees each year, and counting! 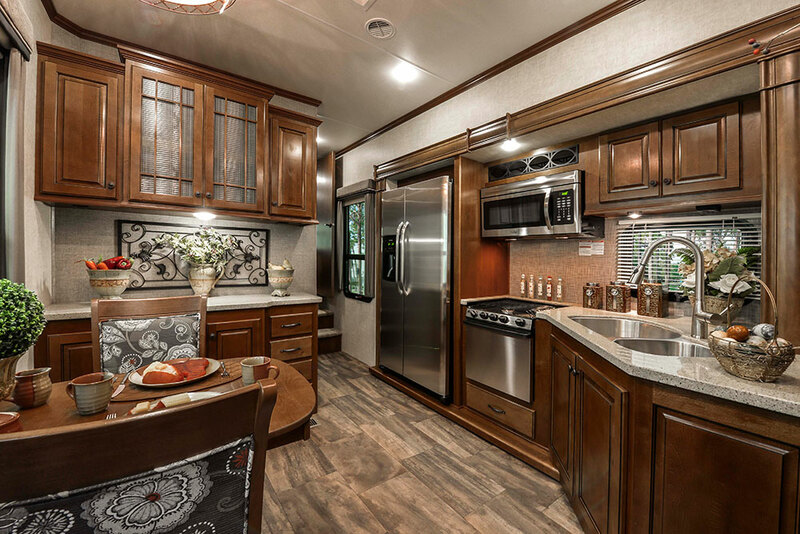 Along with the chance to discover your next Class A, Class C, sleeper van, travel trailer, or fifth wheel, you’ll also be excited to know that the Austin RV Expo is offering seminars, which is a new feature for 2018. 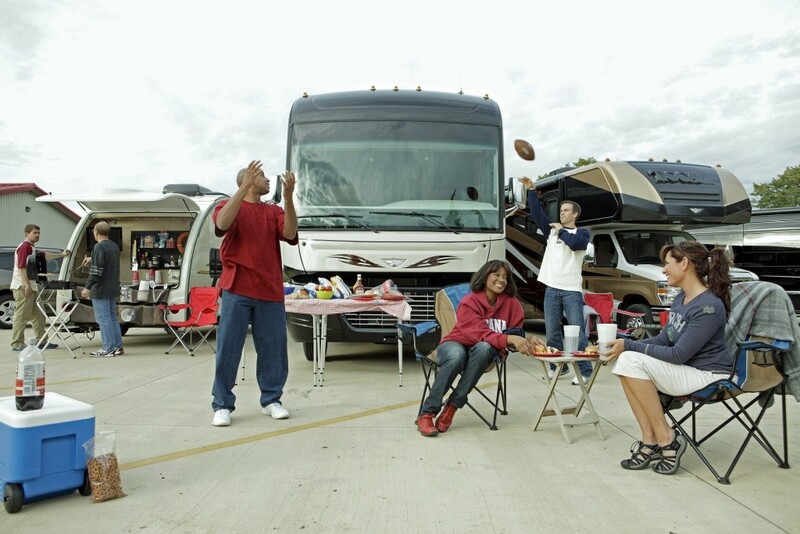 Although the schedule and topics aren’t yet published, you’re sure to learn some helpful hints that’ll make your next RV vacation even smoother and more relaxing than usual. Thursday, February 15: 12 p.m. noon – 8 p.m. They meant it when they said everything’s bigger in Texas. 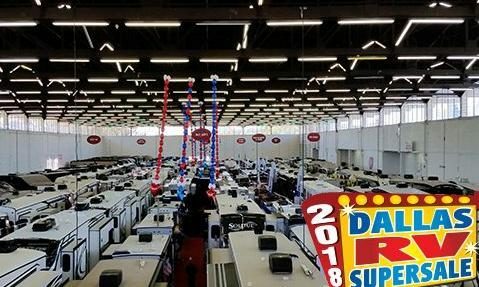 With more than 350,000 square feet of exhibition space to explore, it’s basically impossible not to find the perfect camper for your family at the Dallas RV SuperSale. Top dealers will display motorhomes, fifth-wheel trailers, travel trailers, tent trailers, and tons of RV accessories, and they’ll also be on hand to answer all your camping-related questions. Aside from a baffling number of RVs to explore, the Dallas RV SuperSale also hosts a wide range of other outdoor outfitters and vendors — you can find a full list here. And although 2018’s schedule isn’t published yet, if last year’s seminars are any indication, you’ll learn a whole lot at this year’s free presentations! Thursday, February 22: 10 a.m. – 6 p.m.
Saturday, February 24: 10 a.m. – 8 p.m.
Sunday, February 25: 10 a.m. – 6 p.m.
Tickets: To be purchased on-site at the box office. CASH ONLY. No debit or credit cards will be accepted. ATM on premises. Discounts: Seniors aged 65 and older will receive $8.00 discount entry on Thursday and Friday. Furthermore, $2.00 discount coupons will be available ahead of time at participating show dealers. Discount coupon is valid on adult admission only and may not be combined with special pricing or other offers. In a state as big, beautiful, and filled with outdoor wonders to discover as Texas, it’s no surprise that there are so many fantastic opportunities to attend camping shows and outdoor expos. And while every single convention on this list will give you a great chance to find the vehicle you’re looking for (or even one you didn’t know you needed), keep in mind that there are lots of other outdoor-oriented events going on around the state, including boat shows, hunting shows, and general outdoorsman expos. If you’re looking for even more opportunities to attend an event, simply search for “RV shows near me” in order to find out what’s going on in your area. You might be surprised at how much you find. But then again, you already knew your being a Texan was lucky… so go ahead and take advantage of it!